But what everyone wants to really know is who gets the loot? Who was best able to predict the Blue Ribbon Panels decisions? Attending nephrologist at Georgetown University/Washington Hospital Center with a world beating 47 points. 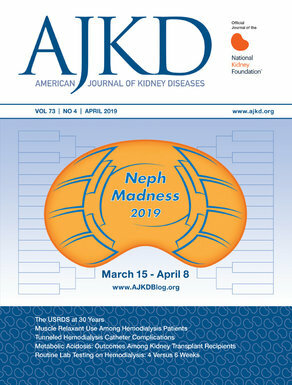 This is Dr. Ganguli’s first foray into NephMadness. He is a recent graduate from Penn and he is still finding his legs in the various responsibilities as an attending. He likes teaching, research and mercifully, UNC over Duke. He also prefers Facebook to Twitter and Michael Jordan over Steph Curry. So, all-in-all, a mixed bag. Collin is an M3 at the Philadelphia College of Osteopathic Medicine and tore up the field finishing with the third highest score at 37 points. He says his hobbies are running, hiking, astronomy, and learning to Cook. When asked what side of the eternal debate: Great taste or Less filling he went straight to the heart with, “Ice cream.” Similarly when asked about MJ versus Steph Curry he answered,”Mario Lemieux.” Well played Collin. Well played. Transplant fellow at University of Alabama at Birmingham and NSMC intern tied for the second highest score with 38 points. Dr. Shah did her nephrology fellowship at Cleveland Clinic. Her particular interest in nephrology is women’s health with a special focus on kidney injury during pregnancy and pregnancy after kidney transplantation. She likes Twitter over Facebook and is an avid reader (mostly non-fiction). Jason Kidd, UNC fellowship, and current VCU attending and noted Foosball expert also scored 38 points. And I must note that like the NCAA, this (former) Tar Heal missed the championship match calling atypical HUS over this year’s Villanova, Conservative Care. He would take MJ over Curry and prefers Twitter to Facebook. He is serial knee ligament abuser but still plays pick-up basketball and softball. Indiana University team (35) led by Drs. Sharon Moe and Ranjani Moorthi with their talented fellows Drs. Doshi, Aftab, Gaur, Jawed, Malas, and Gupta! Susan Ziolkowski (34), Nephrology Fellow at Stanford University. Please note that with the reduction in the number of medical concepts from 64 to 32 teams this year, ties were inevitable unfortunately. There were three prizes where we needed to break ties: Top Resident, Top Fellow, and the ninth runner up. For more on how tie breakers work, please see the NephMadness 2016 rules. Every year we give awards for the best NephMadness tweet author and every year Dr. Kupin tries to win (we still haven’t told him that as a NephMadness contributor he is ineligible). This year the Best Tweet Author goes to Sivakumar Sridharan (@sayitmyway), who is nephrology fellow at Royal London Hospital, London, UK and a very close Runner Up was Krishnam Raju.P (@krishnadoctor1), who is an Assistant Professor of Nephrology at the PSG Institute of Medical Sciences & Research, Coimbatore, Tamil Nadu, India. This years title for Best Blog Post goes to Dr. Daniel Coyne, who is a Professor of Medicine in the Division of Nephrology at Washington University in St. Louis, for the post on his incredible journey from ESA booster to anemia skeptic. It’s an incredible read that should not be missed. Thanks to everyone who played, this was the best NephMadness yet and regardless of what the future holds it has been a blast!